Just recently, I was doing a paint project at home and encountered something that had never happened to me before. My paint was peeling! And all layers were peeling, so before I knew it, I was all the way back to the drywall in some areas! I didn’t know what I was in for and I feared the worse. Instead, I found out from our paint experts in our store that there is a product called Peel Stop that is designed to combat these areas. It is a clear primer that binds cracking, caulking, and peeling paint with one simple coat. If you need to hide the edges more, then it is recommended to apply a few more coats to feather out the edges some more. 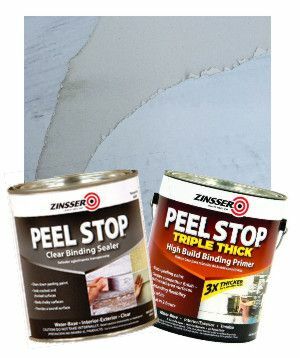 Plus, Zinsser’s Peel Stop is a clear primer, so there is no need to apply another primer coat. Peel Stop is the perfect solution to any paint that is cracking, peeling, sagging, or flaking. It looks like glue and acts like glue as well, penetrating through paint and surfaces to create a strong surface to apply your finish coats of paint to! Peel Stop is also made triple thick, so if you have a considerable edge to conceal, then you might prefer the one coat coverage of a thicker product like this one. If you are in a “pickle” with your next project, like I was with this situation, our experts in the Paint department are always here for you to find the right solution!